Coronary catheterization is a relatively new, safe and effective minimally invasive procedure that allows access to the circulatory system and heart without the need for invasive open heart surgery. Coronary catheterization can be used for both the diagnosis and treatment of many common cardiovascular conditions. In some cases, the diagnostic procedure and treatment can be performed in the same procedure, minimizing downtime and improving the patient experience. 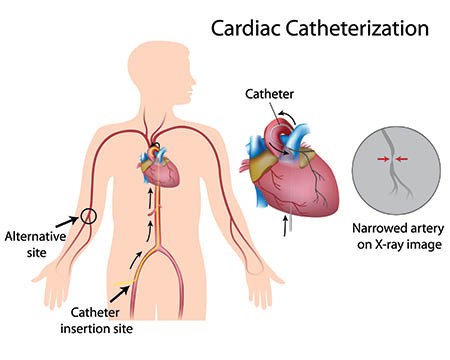 Cardiac catheterizations are performed in an advanced setting known as a cath lab. The time it takes for a cardiac catheterization to be performed varies between procedures and whether the catheterization is purely for diagnostic reasons or if there will be an intervention to follow. Some catheterizations may take just a few hours of prep and procedure time, while others may take the better part of the day. However, most procedures performed with a cardiac catheter represent a reduced procedure time, hospital stay and recovery versus an open-heart surgery option. The most obvious benefit of cardiac catheterization is that it can often replace the need for invasive open techniques for certain procedures and in patients that qualify. Patients that have intermediate risk of open surgery, and who otherwise may not have been able to have surgery, may benefit from the minimally invasive nature of cardiac catheterization. Further, the benefits extend to the postoperative period, where the risk of infection, blood loss, death and other serious complications are significantly reduced when compared to more invasive options. Of course, as with any procedure, risks do exist with cardiac catheterization. Many of these risks are specific to the procedure being performed and will be discussed during a consultation with one of our surgeons. However, the most common risks of cardiac catheterization are the perforation of the wall of a blood vessel through which the catheter is being placed, as well as infection at the insertion site. Both complications are rare, with the former mitigated by choosing an experienced surgeon. Most cardiac catheterizations use fluoroscopy or continuous X-rays that helps the surgeon see exactly where the catheter is located. For patient populations that are sensitive to a relatively high dose of radiation, further discussion is warranted to ensure the benefits of the procedure outweigh the risks. Cardiac catheterization has allowed for the improvement of safety and effectiveness of many of the procedures we offer. As such, this technique has become a growing part of our practice’s focus. Cardiac catheterization represents a technological leap that has improved the patient experience immensely.